Here fish and plants not native to the same region are found side by side, creating an environment that does not exist in nature. The results may be charming and ingenious, but this type of aquarium is often disparaged by purists. A community aquarium is often a popular choice with beginners creating - or "mounting", in aquarists' jargon - their first tank, although this is not a general rule. In this case, the hobbyist concentrates on a particular species, type, family, or group of fish with common characteristics. The choice of this kind of aquarium can be dictated by several factors: interest in reproduction, the attainment of varieties not found in nature (sometimes for competition), or quite simply a fascination which is difficult to explain. As in the previous section, the fish and plants do not have to come from the same region, and the latter are sometimes merely secondary elements. 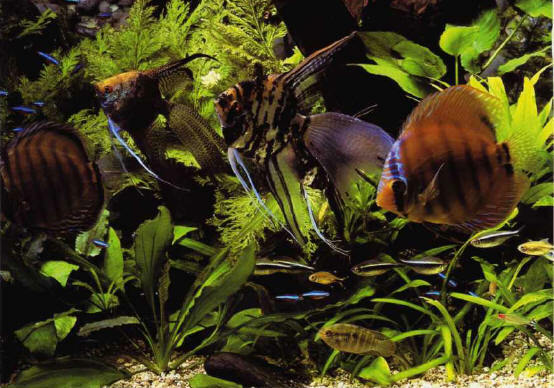 In this type of aquarium fish serve as a foil to the plants, which play the leading role, although the former do also contribute to the equilibrium of the setting, which is not easy to maintain. The plants and fish can come from different geographical areas. The results can be ravishing, sometimes amounting to a veritable aquatic garden, with the aquarist becoming a horticulturist in order to maintain it. As its name suggests, this type of aquarium is highly prized in the Netherlands, and in Germany too, although it is little (too little?) seen in the rest of the world. Here the trick is to reconstruct as faithfully as possible a natural biotope in which everything harmonizes: the water, the soil, the rocks, the plants, and the fish. The density of living beings is higher than that of a natural setting, however. Mounting an aquarium of this type requires a certain knowledge of the geographical area concerned, to ensure the compatibility of the various elements. There are two possible options. The first is the recreation of a habitat suitable for livebearers from the Poeciliid family: hard water with a temperature of 26°C or more, and plants playing an important role. The second is the assembly of a tank for Cichlids: rocky decor, a few hardy plants, with the water fairly soft, well-filtered, and oxygenated. Mainly devoted to the Amazon, these can be divided into two main categories. The tanks with limpid colorless water, neutral or slightly acid, are inhabited by small Characins that are somewhat difficult for amateurs to keep. 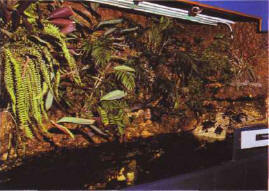 The aquariums with brown, but still transparent water, recreate an Amazon-style river under the forest roof. Its acidity and its color (sometimes even black) are the result of acids derived from humus. These tanks house other species of Characins, or Cichlids, particularly the famous angelfish and discus. The water is very soft in both these types of aquarium. The elements of a South American tank. A biotope of a West African river can be reconstructed in an aquarium. The water, which must be well-filtered, is neutral and quite soft. The fish will include the Congolese tetra, one of the rare Characins found on this continent, and certain Cichlids. 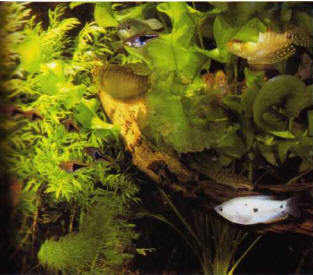 The typical plants in this environment are Anubias. 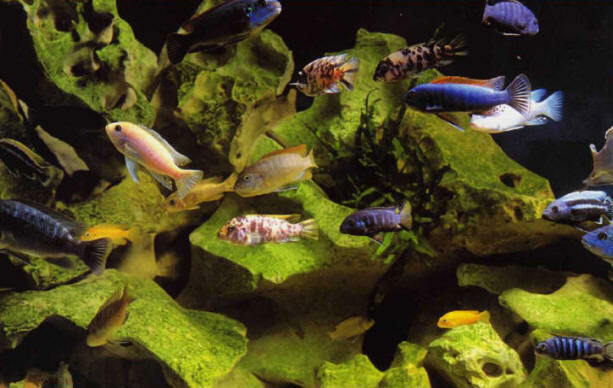 Tanganyika-type aquariums are characterized by their calcareous and decidedly alkaline water. They have few plants, as these are often treated roughly by the fish, but they have a rocky setting, with hiding places and swimming areas to the liking of several species of Cichlids. 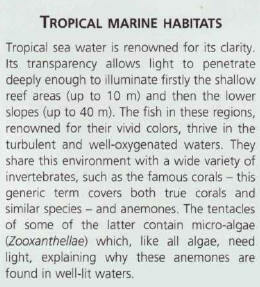 The general characteristics of aquariums for Mbunas from Lake Malawi are roughly similar. Running water Cyprinids can be kept in a tank with clear water which is well-filtered, slightly acid, and soft, at a temperature of 25-26°C. Barbs and danios are the usual occupants of this type of aquarium, some species being particularly recommended for beginners to fish keeping. 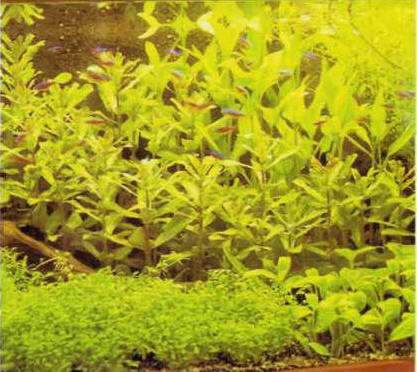 Marshes can be reconstructed with profusely planted aquariums (or aquaterrariums). It is advisable to use genuinely aquatic plants. The water is slightly acid and barely mineralized, to suit barbs, labeos, or fish from the Anabantoid family. Always avoid a mixture of active and placid fishes. West Africa is lined with rivers and streams with an acid pH, and temperatures of up to 27°C. 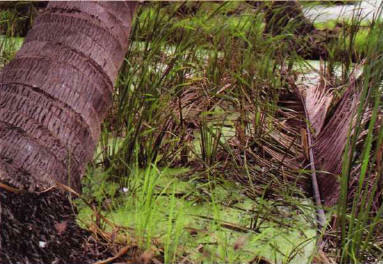 The swampy areas disappear in the dry season, but the fish which frequent them have devised various strategies to overcome this difficulty: some species, such as the killies, lay eggs which are able to resist drought. Aquarium with a collection of several species from Lake Malawi. East Africa is characterized by the presence of large lakes, veritable inland seas, only with unsalted water. The most important of these are, from north to south, Lake Victoria, Lake Tanganyika, and Lake Malawi. 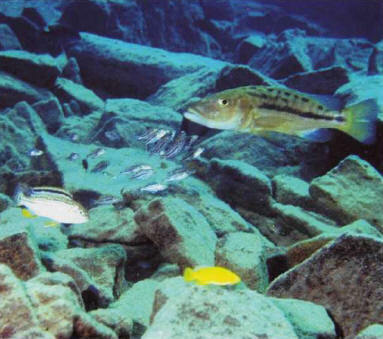 They are mainly inhabited by fish from the Cichlid family, three quarters of which are only found in this region. Lake Victoria, which stretches over nearly 7,000 km2, with a maximum depth of 80 m, contains very hard water which can reach a temperature of 26-27°C. Its fish represent a substantial source of nutrition locally, although they have been in decline since the deliberate introduction of a carnivorous predator, the Nile perch. The lake most familiar to aquarists, Lake Tanganyika, is one of the biggest (31,900 km2, the second largest in the world) and the deepest (a maximum of 1,400 m!). Only the first couple of hundred meters contain fish, which are accustomed to its extremely hard water, a pH between 7.5 and 9.2, and temperatures of up to 27°C. The clear, well-oxygenated surface waters house few plants, the main vegetation being the carpet of algae covering the rocky areas. The species living there sometimes form different population groups, quite close to each other, which can mainly be distinguished by their color. Some fishes take refuge in the empty shells of Gastropods on the sandy shores. This lake is also exploited by the locals as a source of food, but the Cichlids are actively bred and exported all over the world. This is also the case with Lake Malawi, at 26,000 km2 almost as large as Tanganyika, but not as deep (700 m). Its water is slightly less calcareous and its temperatures range from 24 to 26°C. 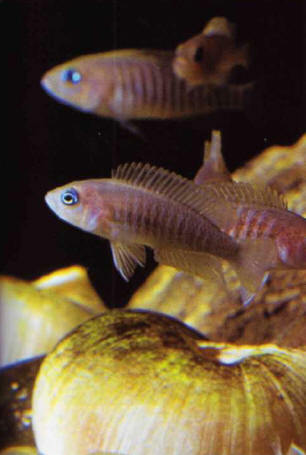 Some species of Cichlids found there are nowadays known as Mbunas. Aquatic zone in Asia, colonized by sea lentils. The water in the rivers and streams is acid, sometimes colored, with temperatures often exceeding 25°C. The swamp and marsh areas are shallow, allowing the sun to exert a greater influence, and their water temperature can be higher than 28°C. Natural sites collect rain and floodwater, while the artificial sites consist of rice fields. The exuberant plant life is either completely aquatic (totally submerged) or paludal (partially underwater; in very wet environments, the base of the plants is often submerged). The borders between the sea and the land provide muddy, swampy areas (often estuaries), in which certain trees - mangroves - plunge their roots. 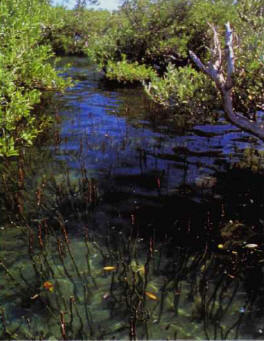 Mangroves is also the collective name for these tropical regions in Africa, Asia, and Australia. The water reaches very high temperatures, of 30°C or more, and the sea water exerts a very strong influence. The salinity is therefore variable, leading to the presence of fauna specific to these areas. The best-known occupant of mangroves is the periophthalmus, an amphibious fish which can develop out of water on account of the form of its pectoral fins. This is characterized by water with less salt than the sea, pH values of between 7.7 and 8, and fairly high temperatures, 26-27°C. The decor consists of branches and roots, but never rocks. Few plants survive in this type of water, and only a few species of fish can tolerate it (see the box on Brackish water species, pages 124-125). The water must be of a very high quality: clear, therefore well-filtered and oxygenated. It can be natural or reconstituted. Roots tangled underwater provide shelter for fish. Marine plants are not common, but algae can appear spontaneously and cover the decor of rocks or dead corals - although their growth is imperceptible to the naked eye, it is fairly rapid. They are introduced to the aquarium in various ways. The soil is very grainy, as the sand is made up of shells and corals. Under bright light, a marine aquarium often forms a colorful environment in which fish develop among inert or living decorative elements, which they can share with invertebrates, including certain shrimps. Novice aquarists are often advised not to plunge into keeping a marine aquarium without first finding their water wings in a freshwater tank, which is easier to tackle. The same ecological rules govern the two types of setting, however, the main difference obviously being the salinity of the water. Let us just say that it is more sensible to start with fresh water, as the plants and fish are more robust and their price is often more accessible. To be realistic, problems with sea water, involving the accidental loss of expensive fish, would discourage many beginners. Nevertheless, apart from the price of marine fish - and there are some cheaper species - it should be pointed out that marine aquariums are not much more expensive to run. These days aquarists are not just concerned with water but often incorporate an adjoining piece of land. Though aquaterrariums are quite tricky to design, the results can often prove spectacular. The aquatic element requires skills similar to traditional aquarium maintenance, while the cultivation of its terrestrial neighbor is not that different from looking after houseplants, except in a very humid setting. The former usually houses fish, but the latter can play host to amphibians, and even reptiles such as sea turtles. ХАМУН , группа озер на территории Ирана и Афганистана, во впадине Систан. На высоте ок. 480 м - устьевые разливы рек Гильменд, Фарахруд, Хашруд. Весной сливаются в единое пресноводное озеро (2-3 тыс. км2).